Traditional mortars for brickwork and masonry that derive from crushed and heated limestone. 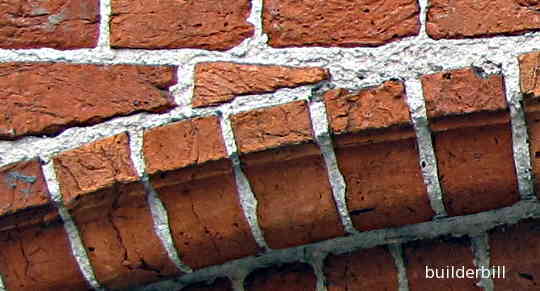 Traditional lime mortar used on an 18th century building in Bruges, Belgium. The main basic ingredient of lime is that most common of rocks, limestone, which quarried and mined all over the world. Lime has been used since before recorded history and the name derives from the old English word "Lim". Another old way of producing lime was to use seashells. CaCO3. Brickwork around an arrow slit window in the 6th century Byzantine Basilica of Sant' Apollinare Nuovo in Ravenna in Northern Italy. Is formed from crushed limestone (or seashell) that has been heated to 825 degrees centigrade. For centuries lime kilns have been used to produce quicklime which has many uses in industry etc. Non-Hydraulic Mortars which set or harden due in the presence of air. What happens is that when the mortar absorbs carbon dioxide from the air it is in effect being converted back to it's original form, limestone. Known as Slaked lime, it used to be made in pits that when the right amounts of quicklime and water were added and mixed, they were then left to soak and form into a mass. This process could well take two or three months before the lime is matured for use. Watery pits of lime were used by tanners and the like, and this thin ready to use lime is still produced today. It goes under various names like "Lime Slurry" and "milk of lime". Builder's lime or "lime putty" was of a similar consistency to butter or soft cheese and it would typically have between 20% to 40% of solids by weight. In this condition being moist, slaked or tempered it is ready to used. When mixed with varying proportions of sand or small aggregate it formed a mortar that dried and set in the air over a long period of time. We are talking about weeks here, and possibly months or even years for it to reach it's ultimate strength. Hydraulic limes Deposits of natural calcium carbonate contain impurities. When they were burned in kilns to make quicklime (calcium oxide) the impurities such as clay and silts change and produce calcium silicates and various aluminates. These materials react with water and the resulting mortar will set regardless of whether air is present or not. This ability derived from local so called "impurities" was seized on by the early lime producers to make a quicker setting and more convenient form of lime, hydraulic lime that was sold as a fine dry powder much like we get today. Made by soaking (slaking) quicklime in water. The main ingredient in lime mortars. The modern bags of powdered hydrated lime are used for many applications as well as mortar plasticisers for brickies and plasterers using Portland cement of course. Used in varying proportions with Portland cement in mortar hydrated lime enhances workability, water retention and bond strength. The carbonation of lime also enhances long term strength development. Many of the older types of lime products like lime putty can still be obtained today from manufactures. 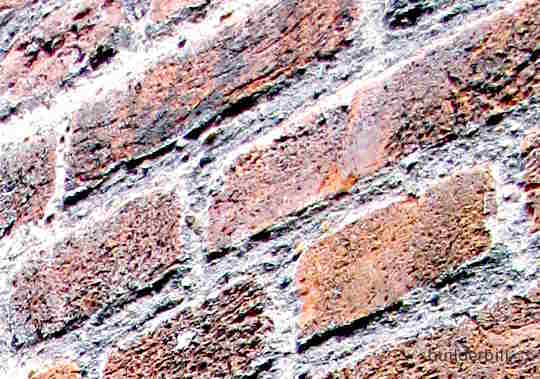 Note, the photos on this page are all of old lime mortar examples, but it is not possible to say with any certainty whether they are non-hydraulic or hydraulic because the other materials in the mortar also effect the look and the staining over time. It would be a good guess that the top one being so white would be non-hydraulic. Mortar used seen in an old section of Hampton Court Palace, London UK.